Welcome to the February edition of the TEACH through Love Newsletter. If you have any trouble displaying this e-mail or viewing the images, you can click here to view it online. emotional relationship with the child. Somebody’s got to be crazy about that kid. That’s number one. First, last, and always." Become a fan and gain access to daily tips, tools, links and inspiration! The TEACH through Love Fan Page is the most regularly updated resource for information on conscious parenting and non-punitive discipline. and you could win a F.R.E.E Parent Coaching Session! Q&A's will be posted on the Examiner.com on WEDNESDAYS. I will be speaking at the 61st Annual Convention for the California Council of Parent Participation Nursery Schools (CCPPNS) - say that ten times fast! I will be sharing the message of unconditional love in TWO breakout workshop sessions at the convention in Los Angeles, March 12 & 13. 1. Dr. Peter Levine, an internationally recognized expert in trauma and healing and founder of the Foundation for Human Enrichment. 2. Wendy Mogel, clinical psychologist and author of Blessings of a Skinned Knee. Click to find out more or to Register! 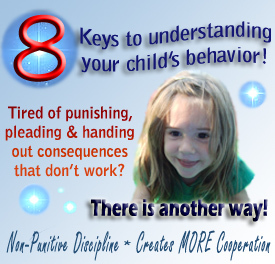 This eight-lesson online parenting course will dramatically change the way you view parenting and the way you relate to your children FOREVER! This will be offered F*R*E*E to newsletter subscribers for a LIMITED TIME ONLY. Don't miss out on this opportunity to journey toward finding peace and cooperation in your home! Eight lessons, delivered to your inbox over the course of two weeks. The time between lessons allows you to digest the information and an opportunity to implement the new paradigm perspective. A comprehensive description of each KEY to understanding your child, based on the TEACH through Love™ Parenting Model. Effective, practical parenting tools to start using right away to build connection and strengthen your relationship. Sample language to enhance your communication skills and ability to identify feelings and needs. Tips for stress regulation and incorporating daily mindful activities for the whole family. Suggestions for further reading and resource links. I have secured a webinar service and will begin hosting free and paid tele-seminars and online parenting classes which you will be able to participate in from the comfort of your own home. Schedule to be released soon! For educators looking for alternatives to traditional behavior management, this 10th anniversary edition of the classic manual is packed with stories from real classrooms and shows how students will thrive in environments that have moved beyond discipline and toward collaborative problem-solving. Through a series of exercises you will tune into your body with awareness and recognize the sensations that accompany stress and trauma. Learn to heal the scars of psychological trauma. Read this book if you want to truly understand what trauma is and how it feels to a child. It is only through the healing of our own past, that we can cease endangering the emotional well-being of our children and remove the barriers left behind from old paradigms. There is so much going on lately - classes, products, workshops and online community building. Thank you for sharing your experiences and for building awareness of the NEW PARENTING PARADIGM!